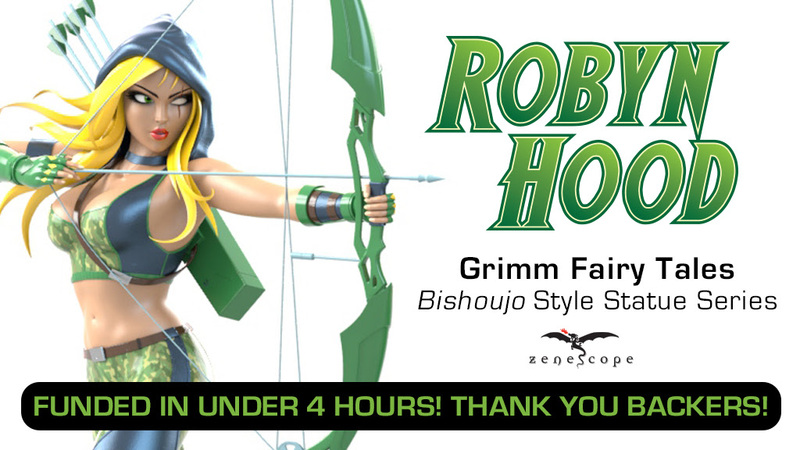 HORSHAM, PA, April 16th, 2019 — Zenescope Entertainment has successfully funded its Robyn Hood Collectible Statue Kickstarter, the next of the Grimm Fairy Tales Bishoujo Style Series, in under four hours. The statue is based on one of the most beloved female heroines from Zenescope’s expanding catalog of comic book titles, Robyn Hood. The main protagonist from the company’s fan-favorite comic book series, Robyn Hood, is a defender in the realms of the Grimm Universe and modern day New York City. Known as a skillful vigilante with her bow and arrow, the statue will feature her wielding her weapon of choice in her classic stance. Based on the artwork by Jason Cardy, one of Zenescope’s top artists, the collectible statue will come in both color and black-and-white. The figure is 1:7 scale and stands at around 9 inches tall. The campaign includes pledge tiers for both retailers and consumers who can reserve the statue and other highly sought after Zenescope merchandise, such as limited edition exclusives by artist, Paul Green. Each collectible statue reserved via Kickstarter also comes with a Robyn Hood limited edition exclusive issue, featuring the statue design by Jason Cardy. The campaign will run until Tuesday, May 14th at 4:00pm. 1First Comics @ C2E2 with Bill Willingham and Travis Moore!